PNG Hunters coach Michael Marum is a man of discipline and he has built his team with trust and belief in the players he has at his disposal. 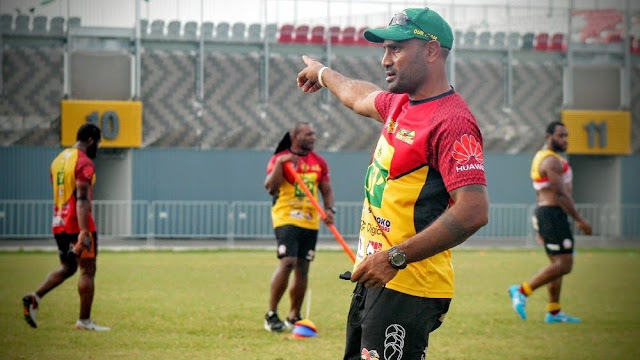 Having already won domestic rugby league competitions in Papua New Guinea and narrowly missing out on reaching an Intrust Super Cup grand final, the man they call the “super coach” of PNG is aiming to lead his Hunters side a step further. "Main thing is discipline and to believe in all the players but we know our boys can do better - will do better,” Marum said. “(It is a) tough season again this year. At the beginning of this year we started winning games and those new players really stood up but now every team sees our game and does their reviews and video analysis on our players. Marum started playing rugby league in the early 1990s in Port Moresby at the Unagi Rugby League for two seasons and then spent the off-season up at 14 Mile with the settlement boys, just on the outskirts of Port Moresby. Next, he joined Port Moresby Vipers in the semi-professional rugby league competition. He was selected to play for the national team, the Kumuls, and he became the 197th Kumul. The 2000 rugby league World Cup in Wales was hailed a success as the Kumuls did extremely well even though they lost in the quarter-finals. Marum was the vice-captain with Adrian Lam captaining the side. He played four Tests and represented his country in the Prime Minister's XIII matches. It was in 2001 that he traveled to Rabaul and joined the Agmark Gurias franchise where he spent 13 years. He started as a player, then took up a leadership role as a captain and at one stage he played as a player/coach and captain. He has also won the SP Cup and SP Shield with the club as a player before retiring at the end of 2005 to be a fulltime coach. “I wanted to give young players coming up the chance to play and also my passion to coach made me hang up the boots in ’05,” Marum said. “I was also doing coaching work while playing and leading the boys around for two hours so that made the transition easy. Marum’s tenure as the coach of the Agmark Gurias side was full of success with the team always playing finals football from 2005-2013 and winning the Digicel Cup and the SP Cup premiership in the semi-professional rugby league competition in PNG. Marum spoke of the challenges facing the players. “There are a lot of challenges with their families for the boys and everyone else in camp. “We got ups and downs … but right now we are maintaining our spot in the top six." Hunters have a bye this week before traveling to Redcliffe to take on the Dolphins at Dolphin Oval.